June 5, 2013: DAVID J. PAUL. I'm not a big rollercoaster fan but I was really riding one during our last event of the season on June 5th -- at first anxious, as usual, but by the end very excited and happy. When we arrived, Dennis Siren was already nearly set up, and at 6:30 he opened the evening with low, slow electronic music. Then as more people arrived he picked it up with a ukulele and vocals. By 7:00 there were fourty poetry enthusiasts chatting, eating, drinking. I welcomed everyone to the last event of season #1, and then managed a few words without looking down at my notes: “About a week ago, I was thinking that because I’ve now gone through a solid year of Immersion Therapy, I should be able to stand up here today and say my thank-you’s without notes. But it’s not working. ... Anyway, this is a reading event.” That seemed to go over okay, so I lowered my eyes and read on. By 8:00, as we broke for intermission, the sun which had been streaming in the window and reflecting in the open back of the terrace was setting, cool air was flowing in, and I went to the bathroom to put on a T-shirt. At our table, Frank Davey was chatting with Eric, the waitresses were drifting through with more drinks, and I went back to see how Linda was doing, sitting in the drafty opening. She had her sweater on and gave me one of those big warm smiles, which stayed with me as I went back to host the open mic section (Dawna was home sick). We picked the three winners of the poetry-book raffle prizes, then began pulling names of readers from the ballot bowl, fourteen in all this evening. Most of the poets greatly excited the audience. As readers came and went, the volume level of the applause rose. Some poems were so thrilling that the now-impulsive audience at times couldn’t wait for the reader to step down but applauded enthusiastically right then, then had to repeat the performance after each of the poems that followed. A small hurdle on a great evening. I would love to write about each poet here, but in my situation as organizer and summary writer, that’s not possible. Anyway, for an open mic to really be open, everyone must be able to read their work without judgement. What I can do, I’ve decided, is describe the one or two poets who received far more accolades than any of the others. In that case the audience is the judge, not me. If the audience obviously feels a couple of poets performed on a different level than everyone else, in whatever way, then that’s fair game. But it’s not often happened. Until tonight. But first I have to mention a special name in the bowl. Early in the open mic, Frank Davey’s name was pulled. As one of Canada’s most celebrated poets, and the headliner at our special National Poetry Month reading in April, we felt honoured and thrilled even before he read. And then the audience’s very positive reaction to his humour and great reading ability just added to it. Davey certainly raised the excitement level of the evening. Near the end, it was Kevin Heslop’s turn. He had just returned from a week-long stay in Montreal, where he had finished reading Jack Kerouac’s ‘The Dharma Bums’. His production there was fourteen poems. He read several of them to us, all with that distinctive Kerouac rhythm and sensibility, to wild applause. One highly excited person called for him to read them again, which he did with the last of the set. On the way to his seat he was stopped by several people who seemed to be asking for his autograph. No, they wanted his URL, where all his poems go. Just when we thought it couldn’t get any better, Cheryl Cashman took the mic. Her life in the theatre was used to great effect as she read a poem she later told me was called ‘Aria- Memory at 80 Years’. We were not only transfixed by the clarity, beauty and power of her delivery but by WHAT she was delivering. After she read (or cried) the last word of the poem, there was a moment of total silence, as if the audience were holding its breath. Then thunderous ovation, hoots, hollars, shouts, and general amazement spilling out over what had just happened. Really, you had to be there. My feeling at the end of the day was that the open mic portion of our event was finally coming into its own. It was really opening up, with a newfound sense of freedom and strength. The spice Cheryl Cashman added was no small part of that. This final event of season one points to a very interesting second season, where the size of the audience may begin to increase when the open mic starts, instead of the opposite as has been the case. Dennis Siren recorded on his mic a few audio clips: one of a David J. Paul poem, all of Kevin Heslop’s reading, and Cheryl Cashman’s poem. Thanks, Dennis. ruffled the pages of the dharma bums for the last time. damn sweet bitter ending like good love or a night when the morning comes to spite you. I’ll keep at the word that way, the rhythm of it, as now I feel gripped by a will to shout love loudly from the top of a high rise and mean it. the rhythms resonating still like on the leaves of trees near train tracks at dusk, wobbling in the air, the trees exhaling, the sun and the moon gone from sight as the dark approacheth, the thunder of the iron behemoth rippling still, impressed upon the memories of the numberless scuttlers and blinkers and flashers and scatterers and so. the tracks warm with wonder. and the fine furry faced animals peeking out the boughs, tentative, my own new words and patterns. and so a finger print on my soul spins and whirls in its own way and rhythm and shall remain. as for death, i guess its just that the sun always seems to be setting for me, the sentence reads from the first word to the last and never not. always had a wet rag of waiting on the shoulders and back of the neck, uncomfortable, mortality dribbling down my back and down my chest. but i will say its good get-up-and-go fuel. it moves. it shakes you to dance. and you do. and that seems to be the best remedy. and the pace and the hunger come from there too. immortals don't write. they tells themselves “tomorrow and tomorrow” but when tomorrow mayn’t be there when you wake up or don’t you better dance today. and so it goes and goes and so it goes. the warm wind of last afternoon was fat and warm and tried to sweep Kerouac’s pages every third of a minute or third minute as fate would dictate. a stout amber brown bottle stood and honey lager bubbled on the gaunt wooden table lazily in the grey afternoon of balcony smoking platitude and I felt fine and fat of spirit. you’d hear mostly the wind battered tambourine of myriad fecundity green-grey and heavy and agreeable and then mixed with maybe say the revving of an engine under the foot of a youth forgivably young down on a beaten street within earshot, wanting to eat everything in sight and he’d have take some time to just nibble, but that was fine and the way of things. fewer birds in the trees tittering but still some, and I took a good pull of the amber beer and set it down and blasted the small heat of my Bic against the furry faced end of a stick of tabacco and inhaled deeply and reclined. suddenly the sky burst laughter or elegy of thunder (I’m not sure which) and that was timed with the unrandomness of nature that may have been written, purely, centuries before, or just came about as a phone call in the stark of night depending on the brush you paint with and imagine. we were making it to a fine Italian restaurant tonight, full of fine fat and very good wine I couldn’t hope to afford for decades, if ever, and the preparation for this night consisted for me of shaving, and the napping of a light nap from which I awoke new and fresh, beer-hungry and full of gay taciturnity. Kerouac mentioned the wisdom of silence this afternoon, and I bit into that like an apple crisp and fine, hungrily chomped and now digesting it. it makes nice calm ripples of gut now as the wind catches smoke wisps, pirouettes them off the balcony and at least they danced a bit before they couldn’t be seen. David John Paul bio: Conceived in Oshawa and born in rith, Kent, England, many years ago, David has lived in several places: Port Hope, Midland, Lachine, Belleville, Agincourt, Kitchener, Dryden, Lucan and London. As a result, he has attended four elementary schools, five secondary schools and three universities. After all that education--and, geez, what else did he know?—David wound up teaching English in six high schools, most of them in London, Ontario. 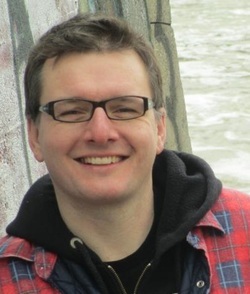 At 17, he wrote his first poem, a short lyric about the two dented garbage cans he put out on the curb in front of his parents’ house in Kitchener. And the first poet that meant anything to him was Raymond Souster and his book Ten Elephants on Yonge Street. Now he reads widely in poetry and appreciates the work of Ammons, Booth, Crozier, Dunn, Heaney, Mahon, Matthews, McKay, Olds, Reid, Szymborska and Williams, amongst others. David has two chapbooks to his name: Locomotive and Tender (Jamie Hamilton’s Pikadilly Press, 1977) and Spilling the Beans (Clarke Leverette’s Killaly Press, 1979). His only full-length book was published in 2005 by Sheila Martindale and South Western Ontario Poetry. And for the music: Ladies and Gentlemen, Dennis Siren! It started with writing that turned into a folk duo which became a 6 piece that turned nto a new city, Fanshawe College and Creative Electronics which I left for a traveling 4 piece rock band which was replaced by a vocal trio, followed by the solo which became a very popular duo up in Grand Bend ending when I played bass and sang lead in a rock trio out of Toronto that ended with me as a solo again for seven years with stints as a karaoke host and “The Amazing Biff “ a children's entertainer. In 1997 I started Streambabies. We were an eight piece doing my original music. That morphed into a six piece then a solo and a duo with my wife Wendy, DJ'ing and an Improvisational music group called Stream Team which transformed into the current trio called ART oF STREAMING. We have played the Eric Stach Free Music series, and performed at the Music Club and Museum London. I, MYSELF am experimenting in instrumentation and styles. I have embraced the new electronic technology and picked up the ukulele.… and that's just my musical side. After a long winter, on May 1st we were back at that wonderful Greek terrace aft of the Mykonos restaurant, now for the first time in months open to the natural light and the evening air. We had practically forgotten what it was like. From the parking lot right behind the terrace, we brought our equipment straight in, my rented mic and speaker, and Don Baker’s electronic piano. This time we got there early enough that I managed to figure out how to do the sound properly, get the volume just right, no feedback. And when Don, a guy from Elmira but the ultimate musician, began moving his fingers over the keyboard, the event was happening. Wow. You had to be there. I had a glimpse of Richie Havens tapping his feet on the plywood with those first guitar strains at Woodstock. At 7:00, host Dawna Perry stepped up to the mic, surprising us all in the most elegant be-jewelled outfit we’ve seen her wear so far. She’s definitely a lady making her presence felt in this city. I had a big organizing revelation because of Sonia’s great responses: The intermission at a poetry event isn’t the intermission. The Q&A is the intermission. If you have solid poetry from beginning to end, it’s too much for the ear to hear. But the Q&A lets the other parts of the mind run freely, the parts that tend to get repressed while trying to oncentrate on poetry. It’s very revitalizing, and we sure felt that during Sonia’s Q&A. Just before the break, Patricia Black, one of London’s matriarchs of the arts, told us that Cornelia Hoogland was at that very moment in an airplane about to land at London airport, arriving from BC’s Hornby Island. Hoogland, who has lived in London until recently, wrote the script for her coming play, ‘Red’, based on her book of poems, ‘Woods Wolf Girl’, which in turn was based on the fairy tale, ‘Little Red Riding Hood’. As we all know, Red, not so little in Hoogland’s play, is attacked by a big bad Wolf. So Patricia’s presentation of it was very apropos for this Sonia Halpern evening. The play’s producer, Ashleigh Barney looked on from their table with a smile. Her Fountainhead Theatreworks production runs from May 10 - 18 at the Fanshawe Theatre at Citi Plaza. tabloid-type poems out of newspaper professionally blended with art and poetry. The parchment covers were tied with twine. Melissa announced her second issue, ‘Kiss and Make Up’, due to be released in June, but too late for our June 5th event. We will, nevertheless, have it for sale when we’re back on Sept. th. And we’ll keep selling it at our book table. Dawna brought forward the Ballot Bowl to begin the open mic. Most of our open mic readers place their sheet of poetry on our music stand, clear their throats and carefully intone. Wendi Waters, from the East Village Arts Collective totally upset that apple cart. Everything had to be adjusted around her large laptop, which she balanced on her forearm, and twisted her body around to get the words into the mic and her eyes to the crowd. But she managed a masterful reading nevertheless, and, with some practice, may begin a new trend. 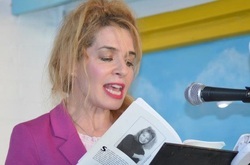 Her poetry friend, Laura Dent, watched in awe, as did we all, but brought back the music stand when she took the stage. Throughout Sonia Halpern’s reading and Q&A, and even into the open mic readings, I had noticed Joan Clayton, with an intensely thoughtful look on her face, scribbllng on the back of some receipt. When her name was called, she read...no, she performed...the poem she had just then finished, about strength in women, and read it with that same strength. Suddenly the event felt like one of those Beat hangouts in the 1950s, where this sort of thing was what you did. Then Kevin Heslop, in dark glasses, carried the feeling even further into the evening, sounding very much like Kerouak himself. boom. And then his performance began. Slowly, then faster, yet not hard to follow, very affecting. He deserved that big hand at the end. It amazes me that anybody can do that. I have a hard time just trying to talk with my hands. Considering the fact that our special April event had been scheduled for only one week before this one, unavoidably, and that people had been pretty much poetryed out during National Poetry Month, which ended the day before, this event still did pretty good with 38 showing up and 13 open mic readers. So we were all fairly satiated and satisfied as the last poem by the last reader wound down. We stirred in our chairs, looked around, began thinking outside thoughts, and that was when Roy Macdonald strolled in the open back of the terrace with the late evening air. Roy is famous for being the most famous person in London. Just for starters. He’s the little, old guy with the long white beard and scraggly white hair whom everyone has seen on the street at one time or another. And of course, this night, as always, he was carrying his two full shopping bags (which, by the way, contain copies of his poetry books he sells continuously -- Roy is a walking retail outlet). When you get to know him, you soon find he knows everyone, or at least he knows someone everyone knows, and certainly has known everyone and anyone worth knowing. I know him and he knows me because we both attend the Central Library’s Socrates Cafe, the best opinion outlet in the city. Well, the thing about Roy at a poetry reading is that he looks like the one person in the city you do not want to allow on your stage, no matter what. But Dawna, seeing the excitement and hearing the murmurs on his entrance, said, “Do we have any more readers?" and several people all at once said, ‘Yes, put his name in!’ Roy, now sitting at one of the side tables, looked around: Who? Me? So he went up to the mic, stood there for a second so frail-looking and small, and then, in a clear deep voice, calmly and with perfect grammar and delivery and vocal projection, began telling a story about a woman he had met at Woodstock, the one ideal woman of his life, and the story became a poem perfectly performed, one that held us all enthralled right through to its beautiful, mystical ending. Our special reading/open mic at the Landon Library really was special. All 45 attendees enjoyed it tremendously. Bernie Koenig and Emma Wise opened the evening with their incredibly beautiful vibraphone/cello combination. Their last piece, Koenig’s tribute to George Gershwin, held the audience spellbound, opening slowly with the vibraphone, picking up tempo as the cello slowly emerged brom the background, and finally the vibraphone being overwhelmed by the powerful, vibrating strings of the cello. The audience members, who before that were milling around, taking their seats, chatting with their neighbours, were hushed into complete silence by the beauty of the music. Host Dawna Perry poked her finger in the eye of winter by wearing a lovely summer gown, despite the hopefully last late snowfall of the season. The gracious Ola Nowosad, who co-facilitates Poetry London’s workshops along with Tom Cull, introduced the first, much-anticipated feature poet, Frank Davey, a man who can truthfully take credit for single-handedly introducing post-modernism to Canadian poetry. Ola added Davey’s decision, that very day, to begin a new chapter in his long career by launching a blog on April 30th on our very own London Open Mic Poetry Night website. No one has any idea what he will be writing about, only that the content will be wide-ranging”. Then Davey took the podium to read. Who would have thought that this great revolutionary poet and scholar would be such a funny reader. 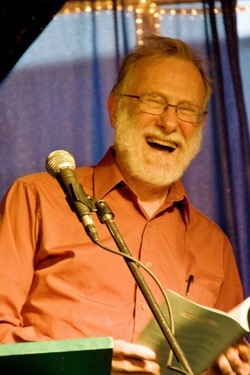 He read some of his famously post-modernist poetry, that to many might seem utterly mystifying on the page, with such zest and whimsy, with such humourous body-language and vocalizations, that the audience felt it was watching the emergence of a new Canadian comic instead of the sober poet they had expected. In the bar after the event, Eric Martinez Richards, our photographer and a great poet in his own right, told me we should try to get Davey to open the Frank Davey School for Stand-up Poets and give us all lessons in how to read poetry in public, because his technique just can’t be improved upon. Then yours truly, Organizer Stan, told the strange story of how he decided to pair Tom Cull, a poet with not a single book to his credit, with the much-celebrated national legend of Frank Davey, who had his 27th book of poems, ‘Spectres of London Ont’, for sale at the back table. Suffice it to say there was much hilarity, amusement and, in the end, agreement that the right decision had been made. If Tom doesn’t mind, that introduction may be posted here later. We even had time for our traditional open mic after the intermission. And everyone went home happy. Our special reading/open-mic in celebration of National Poetry Month was held in the large basement hall at Landon Library (London's Wortley Village), not our normal venue. (We return to the Mykonos Restaurant May 1st). Our two featured readers, Frank Davey and Tom Cull, were followed by a shorter version of our traditional open mic. 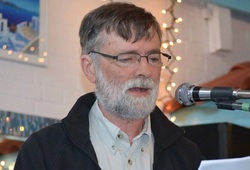 Frank Davey: Since 1963, the celebrated Canadian poet FRANK DAVEY, now a resident of Strathroy, has been the editor-publisher of the poetics journal Open Letter. 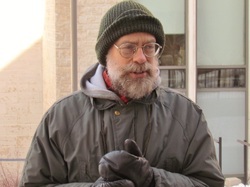 In 1984 he co-founded the world’s first on-line literary journal, Swift Current. A prolific and highly-esteemed author of numerous books of poetry (the latest published in 2012) and scholarship, and many articles on Canadian literary criticism and poetry, Davey writes “with a unique panache as he examines with humour and irony the ambiguous play of signs in contemporary culture, the popular stories that lie behind it, and the struggles between different identity-based groups in our globalizing society—racial, regional, gender-based, ethnic, economic—that drive this play, ”according to his publisher’s reviewer. To an audience of 45 people, London poet Christine Thorpe read from her book Tendered Arms (2011). 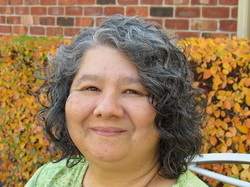 A native of Penticton, BC, Christine is now the Development Co-Ordinator for Poetry London. Her poems ``are addressed to `those who feel in each bright stream, the pull of an underground river`. Willing readers are drawn from personal crossroads into subtly strange lands where skies may be truly falling but the play of imagination endures. Each poem tells its own tale.`` Before settling on English Literature as a field of study, Christine studied biology, mathematics and computer science. Her two books, A Rind of Sun(Serengeti Press, 2008) and Tendered Arms (Manifold Books, 2011) are co-authored with James Wood, whose drawings ``complete`` selected poems. To an audience of 47 people, D'vorah Elias was born in Korea, abandoned by her mother there, and subsequently adopted to America, where she married the late physicist Vic Elias. Raising four children in London, Ms Elias has also, for her 25 years here, been a member of the Sheila Martindale poetry workshop, which includes some of the best poets of the area, including John Tyndall, who was our featured poet in January, and David J. Paul who will read on June 5th. She is also a playwright. See: Seven Poems by D’vorah Elias. Ms Elias read from her book, Ani (2011) Copies are available from Susan Merskey, Business Manager of South Western Ontario Poetry, price $10 per copy. E-mail Susan at susan.merskey@sympatico.ca for more information. Music: At our launch last October, we were excited to have Bernie Koenig and Emma Wise play vibrophones and cello before the poets took over the microphone. Imagine: Bernie hovers over his vibraphone with a yarn-covered mallet in each hand, sometimes two. They bounce off the metal bars producing bright, room-filling notes that vibrate, slowly dissipate and tremble out into each other. Sitting in a chair to one side, Emma Wise touches the bow to her strings and draws up into that lightness from the depths of the cello the most exquisitely melancholy vibrations. With about 50 attendees, this was our most popular event so far, even surpassing our launch. RAFFLE PRIZES. These included Tyndall books and broadsheets. Everyone who donated to London Open Mic Poetry Night received a raffle ticket. Pushcart Prize Nominee RL Raymond launched his third book at London Open Mic Poetry Night on Dec. 5, 2012, followed by an hour of open mic. There were raffled give-aways, live music, food, drinks and good times! RL Raymond launched his third book 'Half Myths & Quarter Legends', for which he has just been nominated for the prestigious 2013 Pushcart Prize, published by a New York-based organization which awards the best of the small presses. A raffle was held for three prizes, each composed of unique, signed broadsides and signed books. An hour of open mic followed the book launch, with each five-minute reader selected randomly just before they read. Those who wished to read signed a ballot when they entered. 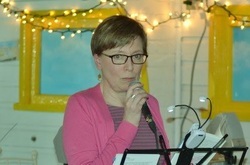 UWO’s Kathryn Mockler, Poetry Night's featured poet, read for fifteen minutes, followed by Q&A. Kathryn Mockler has an MFA in creative writing from UBC, has been published in many journals, has two collections in print, has had her work screened several times on television and screened at a number of festivals. Currently she teaches creative writing at UWO and co-edits the UWO online journal ‘The Rusty Toque” at www.therustytoque.com. Andreas Gripp’s reading at the launch of London’s Open Mic Poetry Night in the terrace at Mykonos Restaurant Oct. 3 seemed to have more humour, as well as more profound and deeply interesting moments, than I remembered ever hearing from him before. Maybe it was actually the music that preceded him, the vibes and cello of Bernie Koenig and Emma Wise, that made me more open to his poetry, or the cozy Greek atmosphere of the terrace, or the fact that most people had come early for the music and food and wine and were comfortable and ready when Andreas began reading. Or maybe it was just me hoping it would be extra special. Or it could have been all of us wanting and needing a new series of events for the poets of the city who aren’t into slam. Or all of these. As soon as London’s Town Cryer, Bill Paul, opened the night with his rousing introduction, and I began the proceedings, I was amazed to see the night proceed by itself, despite my numerous flubs. Without having to be pushed or pulled, everybody enthusiastically got right into it and really enjoyed themselves. The open mic section went smoothly with Dawna Perry picking the names randomly from the pot and calling the poets up to read. Very few went over the allotted five minutes, and the audience obviously enjoyed the variety of poems and readers. Everyone was surprised at the general quality of both the poems and the reading of them. We did some musical chairs to prepare for the table readings, with people forming larger groups separated from each other for sound buffering. Each group organized itself, self-appointing readers and their sequence and how many poems each read. By 9:30, after three quarters of an hour, just about everyone who brought poems, of the 47 in attendance, had read and most had read more than they had expected to. People who had not even put their names in the Ballot Bowl for the open mic brought out poems in the general excitement. The room was constantly abuzz with discussion, laughter, and conversation. At the smallest group, where I spent most of my time, John Tyndall, one of London’s most well-known poets (and our January 3rd reader), happened to be sitting next to our own newby poet Dawna Perry who read from her coil-bound notebook. John made a few suggestions, and Martin Hayter leaned over and remarked to me about how surprisingly good she was. Martin also read to our focussed attention. Neil Desborough and I, the two country gents at the table, (Neil a real one, living on a farm out in the Ingersol area) listened with the reserve and taciternity we have earned from our long years of toil (or is it shyness, at least on my part), while the hubbub ensued around us. There were a few “little hickups” through the night, as Martin was kind enough to call them the next morning when he found me exagerating every uneven breath in my mind. But now, a couple days later, I’m pretty happy and pumped to go on to #2, with Kathryn Mockler.